I am an eager and avid traveler. Well, it’s more accurate to say eager than avid as I have travelled some, but not a lot. But I am hungry to travel more, especially now that I have retired. At the same time, there are times when I want my travels to other countries to be more than simply visiting the top ten tourist destinations or sipping lattes on a picturesque street corner. Not that there’s anything wrong with that. But on some of my travels abroad I want more from the experience and, to the point, I want my time in other peoples’ countries to be at least a little about giving back or helping those who have less than I do. Considering how fortunate I am in my life in the United States, that’s a lot of people. 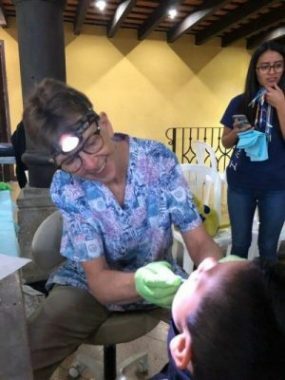 Thus, incorporating community service as part of my international travel is becoming more of a priority to me so when my friend Leslie started telling me about her great experiences with dental projects with Global Dental Relief, I was all ears. Leslie has been on GDR trips to Cambodia, Vietnam, and Nepal. We looked at the 2019 schedule and chose Guatemala. In part because I speak moderately reasonable Spanish and in part because the timing of the trip worked with our schedules. I would have been happy signing up for any of the clinics. Clearly some clinic sites are more comfortable than others. But all of them sound intriguing. We chose to arrive in Antigua, Guatemala a few days before the dental clinic would start up. I’d highly recommend doing that if you are comfortable finding your way in a town where English among the shopkeepers, hoteliers, and vendors is common but not guaranteed. Antigua is a very easy city to be a tourist in. From Leslie’s previous GDR experiences, we knew our days at the clinic would be full and a bit tiring, so we expected there wouldn’t be a ton of time or energy left after clinic and dinner. 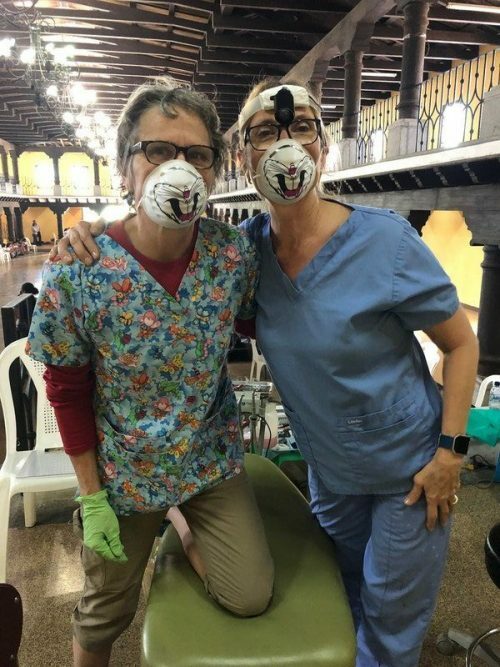 By the time the dental team arrived two days later, and we all met for our welcome dinner, Leslie and I felt we had had a good introduction to Antigua where we’d be staying while working the clinic in a nearby town, Ciudad Vieja. The clinic work itself was very much what I had come to expect. Leslie’s descriptions and the useful information provided ahead of time by GDR helped shape my understanding of how the days would flow and what to expect when working with the children who were the dental patients. 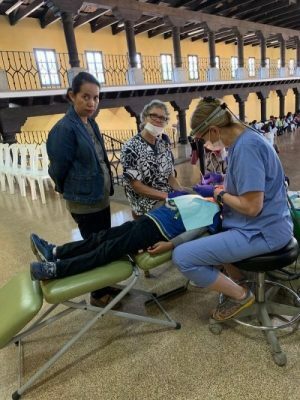 Considering all the logistics of setting up a temporary clinic in the back of an empty municipal building and providing dental services in a foreign language to roughly 100 kids each day, it was impressive to me how well organized the processes were. Key to the success were the translators from the area who milled about waiting for a dentist or dental assistant to beckon them over to help in the two-way communication between patient and dental team. Sometimes these translators became the calming element, standing by, murmuring soothing and encouraging words, and often holding the hands of the nervous children. I was pleased with the usefulness of my intermediate Spanish skills and was quite often able to handle the entire exchange without calling over a translator. I also learned many useful phrases from the translators not only about teeth and dental care but also valuable calming phrases. I loved my exchanges with the kids, and got good at asking about their pets, their family, their favorite studies, and favorite sports as a way of calming them before the dental exam began. Also impressive were the talents, big hearts and tirelessness of the dentists and hygienists. Leslie and I were each a general volunteer. We did what we could to make the work of the dental professionals easier and more efficient so we could serve more patients. I was assigned for the whole week to one dentist and we developed a good routine. Leslie worked with a dentist a few days then was shifted to working with the fluoride, which gave her one-on-one interactions with a lot of the kids. It was really great doing this trip with a close friend. At night and on breaks, Leslie and I did a lot of comparing notes. I gave her a few tips each day in basic Spanish which she put to immediate use. If I had gone on the trip alone, as a number of folks had, there still would have been plenty of camaraderie and support from the entire group as we were all experiencing more or less the same challenges and joys during the clinic days. But doing it with a friend meant that we will always have this shared experience. Guest blog by GDR Volunteer, Celia Heron on her volunteer experience in Guatemala. Thank you, Celia, for sharing your thoughts and volunteer experience! I am an eager and avid traveler. Well, it’s more accurate to say eager than avid as I have travelled some, but not a lot. But I am hungry to travel more, especially now that I have retired. At the same time, there are times when I want my travels to other countries to be more than simply visiting the top ten tourist destinations or sipping lattes on a picturesque street corner. Laos means the land of a million elephants. Many travelers visit to see elephants, and we were no different. After working hard to provide complete dental care to 960 kids over six days in Cambodia, we flew to the ancient royal city of Luang Prabang ready for an adventure. There are less than 1,000 left in this beautiful country – both wild and domesticated elephants combined. Global Dental relief needs your help carrying out our mission in Guatemala this summer! We are currently looking for dental professionals to join us in San Martin in May and July/August! We have a space for dentists and hygienists to volunteer with us in a week-long clinic serving children in need with free dental care. The thought of packing for an overseas adventure can be both overwhelming and paralyzing. The task of cramming a month’s worth of belongings into an airline-approved suitcase can seem daunting for many travelers. We’re here to help! Once you have registered for a trip with Global Dental Relief, you will receive a “Welcome Packet” via email. This packet is full of detailed information regarding your upcoming adventure – including a packing list! For many students, a spring break trip to Guatemala or a summer spent volunteering in Kenya seems impossible and often too far out of budget. Likewise, traveling to a remote Himalayan village and providing free dental care to children in need may be something many only dream of. Thanks to the generous support of Cranberry USA, pre-dental students and pre-dental hygiene students now have financial support to make this dream a reality!